At 2012’s East Bay Mini Maker Faire at Park Day School in Oakland, one room became resplendent. Silvery, shimmery sheets of mylar draped over its doors and all its surfaces. 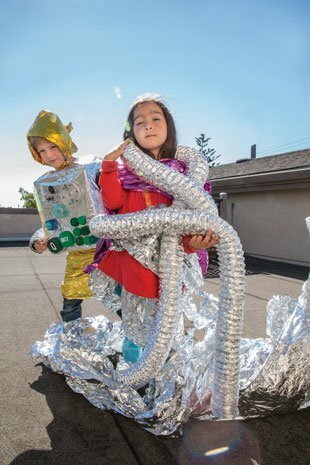 Kids and adults alike crafted the mylar into hats, gowns, spacesuits, and robot costumes. Stepping into the room transported me to some campy sci-fi classic (Barbarella? Saturn 3?). Later, I spotted brilliant fashionistas bouncing around the event wearing the products of their intergalactic sculpting.